﻿The Duke is an abstract game that pits 2 players against one another in a chess-like manner. 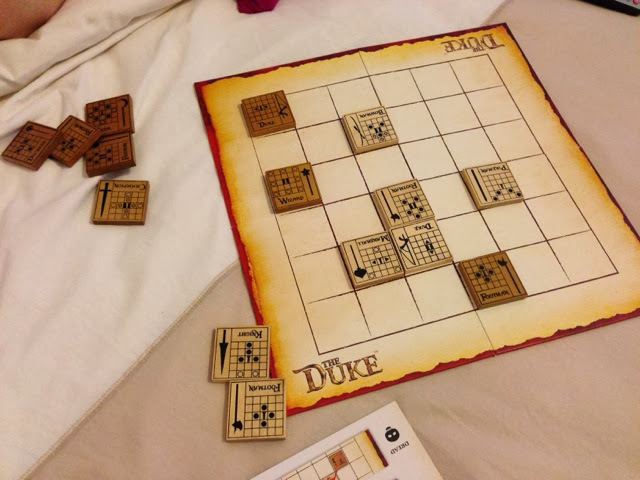 Players control a variety of tiles and throughout the game may bring them into play in order to capture an opponent's duke and thus win the game. Gameplay wise, its a very easy game to learn and to play. Each player starts of with a duke and 2 footman tiles which they place on a board with a grid (similar to chess). During a player's turn, they can either move a tile/piece, use the power associated with a tile/piece and draw a new tile/piece from his/her bag. Each piece has its own style of movements (similar to chess) and through clever moving and placement, players will attempt to "checkmate" and capture the duke. It is however not exactly like chess and here are the differences that make this game shine in my opinion. The pieces all have individual movements that are meant to be thematic and are different from chess. For example the bowman can kill another piece but not move. There are variable powers in the game that does not exist in chess. The most important difference I feel is when after moving or activating a piece, you need to flip the tile/piece over. Why ? Because each tile/piece actually has 2 different patterns of movement and thus when you decide to move a piece, you can only move it according to what is currently displayed. This I feel is the clincher for this game. Either you will like this or despise this. It adds so much replayability but at the same time will reward players who are more experienced. Finally, there is an added element of randomness when players draw a tile from the bag. Now its not all fine and dandy though for this game. The sense of randomness from the tile draw can be disconcerting because sometimes you may end up drawing a tile that can win you the game instantly. I think through experience players will learn how to avoid this (i.e. don't leave your Duke exposed or cornered for such moves). Another slightly tedious aspect (but not by much) will be knowing both sides of movement patterns a tile/piece has. This can often lead to players peeking underneath and then plan as to what they can do so as to formulate their strategies.A small pet peeve will be that while the components are really nice wooden tiles with clear markings, being jumbled up in the bag can lead to dents and scratches. Already my tiles seems slightly "wounded". The games I have played so far have been quite fun. Even though I don't think there's any official lingo to use when threatening or capturing the duke, we have taken to using "Check" and "Checkmate" when playing the game. Some opponents at GENCON use "Guard" though, not sure how that came about.The main few strategies I have developed are 1) To always ALWAYS ensure you do not block your own duke and to ensure your duke is always mobile. 2) To know when to draw tiles because its tempting to clutter the board but often you may end up not being mobile yourself. 3) The duke is very powerful. Unlike the King in Chess which is often very protected, the Duke is similar to a Rook in Chess. It can move many spaces and often can be used to attack very well. So in summary, The Duke reminds me a lot about chess but at the same time, has so many elements that makes it feel like an improved version or a more modern take of chess. If you do like chess, this is Highly Recommended. if you don't like chess but like something challenging and for 2 players, Highly Recommended. Even if you typically dislike abstract games I would suggest you give this a try at the very least. FYI the term "Guard" is from the rules. See page 5 of the rulebook under "Capturing Tiles" for the use of the word "Guard".